A woman on an American Airlines flight from Chicago to Miami had trouble placing her carry-on bag into the overhead compartment, so a flight attendant did it for her. When the plane landed and the passenger tried to retrieve her luggage, it was wedged so tightly in the overhead bin, she had to pull so hard that it “flew out of the compartment” and forcefully hit her and knocked her off balance. The force knocked her into an armrest of the seat behind her. The passenger was transported by paramedics to an emergency room for treatment. She later had to undergo surgery and suffered for months as a result of the injury. She filed suit against the airline. According to her lawsuit, the Chicago to Miami was the last leg of her journey which began in Jordan. Since her trip included international travel, her lawsuit was determined according to the Warsaw and Montreal Conventions. An Oregon man sued Southwest Airlines for damages based on a head injury he received when a flight attendant was negligent in helping another passenger try to stow luggage in an overhead bin. The bag fell onto the Oregon man who was sitting in an aisle seat. The injured man claimed the airline was negligent in allowing an oversized bag to be carried onto the plane. In addition, he alleged that the flight attendant was not properly trained in how to load the overhead bin, which resulted in the bag falling and hitting him on the head. He claimed he incurred medical expenses and lost wages due to time off of work. Two passengers were injured in the same way: luggage falling from an overhead bin and injuring them when the bag hit them. But, the outcomes may not be the same. Different laws apply to those injured in domestic flights than for those injured in a flight that involved a stop in a foreign country. If the passenger can prove in court that the “accident” meets this definition, the airlines will be liable for the injuries. Proof of negligence is not required. 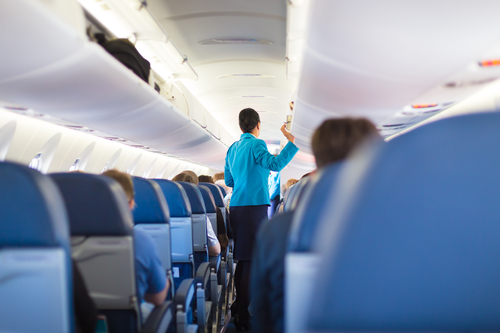 When a passenger is injured by falling luggage from the overhead bin in a domestic flight, and the passenger had no foreign destination on his or her itinerary, the injured person has to prove negligence on the part of the flight attendant or airline. The airline may have been negligent in allowing oversized bags to be crowded into the overhead bin, or in not properly training attendants in how to stow the baggage. The attendant may have been negligent in not securely latching the bin. Commercial airlines are considered common carriers, which means they are required to exercise the “highest degree of care and diligence in the safety of their passengers and cargo.” They also must follow their own regulations, and if a passenger was injured due to the failure of an employee to follow those regulations, that may also be grounds for a lawsuit. If you were injured by luggage falling from an overhead bin, you would benefit from the services of our transportation injury attorneys and staff at the Blumenshine Law Group. The law that applies depends on your personal itinerary. We are skilled in proving negligence whether you were on a domestic flight, or your itinerary included a foreign destination. Contact us or call (312)766-1000 as soon as possible after your injury, we will provide you with a free consultation.